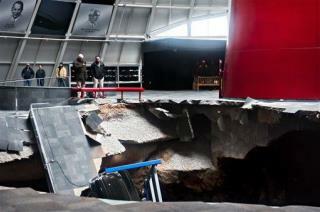 (Newser) – The eight Corvettes that got swallowed up by a sinkhole at the National Corvette Museum in Bowling Green, Kentucky, on Wednesday will likely be stuck there for weeks, officials say. The area must be stabilized before the historic collector cars can be retrieved; that will take as long as three weeks, and then it could be as many as six more days to actually get the Corvettes out, according to a company tasked with assisting. After that, General Motors will try to restore the cars, Reuters reports, with the task falling to General Motors Design in Warren, Mich.
do you know where you can buy a corvette dirt cheap? not to thick slab no rebarb either, was that an obama shovel ready job?